Alternatively activated macrophages (M2) exert anti-inflammatory effects and are crucial for keeping balance between protective and destructive cell-mediated immunity in healing phase of inflammation. Two members of the interferon regulatory factors family, IRF5 and IRF4, are known to promote M1 or M2 phenotype, respectively. Our study aimed to analyse the effectiveness of the M2 differentiation process in vitro (achieved by IL-4 stimulation) and its relationship to the stage of type 1 diabetes mellitus (DM1) in juvenile patients. To identify the basic changes in M2 phenotype, we examined the expression of the surface CD206, CD14, CD86 molecules, intracellular IRF4 and IRF5 transcription factors as well as IL-10 and TNFα intracellular production. Ten newly diagnosed (ND-DM1) and ten long-standing (LS-DM1) patients were enrolled into the study. The control group consisted of six children. We observed a significantly higher number of unpolarised CD206+CD14+ cells in the M2 cultures of DM1 subjects when compared to healthy ones. Examined cells presented common features with M1 macrophages (high levels of the CD14/CD86/IRF5 markers); however, they were weak TNFα producers in ND-DM1 patients. For the first time, we have revealed dysregulated IRF4/IRF5 axis in the analysed subpopulation derived from diabetic patients. Additionally, monocytes of ND-DM1 children were still able to differentiate into regulatory IL-10+ M2 macrophages, while this process was highly limited in LS-DM1 patients. Summarising, we suggest that the M2 polarisation process is less effective in DM1 patients than in healthy subjects and it may vary depending on the stage of disease. It can be concluded that in vitro differentiated M2 macrophages may be used in the future as inflammatory inhibitors for adoptive therapy experiments in ND-DM1 subjects. Type 1 diabetes mellitus (DM1) is an organ-specific, metabolic disorder with an autoimmune background. In particular, DM1 affects children and young adults below the age of 30 and that is why it is called juvenile-onset diabetes . The process of autoimmunity begins with an asymptomatic period called ‘prediabetes’ in predisposed individuals. For the reason that DM1 is a lifelong disorder, after destruction of β-cells, it subsequently leads to the development of lymphocyte-related autoreactive reactions . DM1 patients in latter stages of the disease are characterised by a low-grade chronic systemic inflammation . It is accompanied by elevated serum levels of TNFα  and formation of leukocyte infiltrations in blood vessel walls. The immune cell accumulation may be reflected by a decrease of blood flow, tissue injury and at least development of long-term vascular complications, observed in renal microvessels as well as retinal capillaries [5, 6]. In peripheral blood of human subjects, we distinguish 3 monocyte’s subsets based on the surface CD14 and CD16 molecules expression levels. The main subpopulation of classical monocytes (CD14++CD16−) makes up approximately 90% of whole blood monocytes. The second group is composed of non-classical monocytes (CD14dimCD16++) and the third, the smallest one, of intermediate monocytes (CD14+CD16+) . Circulating monocytes play a major role both in an innate and adaptive immunity, and they are able to differentiate into dendritic cells or macrophages in vivo, depending on the microenvironment conditions . Enhanced monocyte activity, phenotype changes [9, 10] and their ability to spontaneous production of pro-inflammatory cytokines  were recently reported in type 1 diabetes. In our previous works, we observed an increased number of non-classical and intermediate monocytes in peripheral blood of complication-free DM1 juvenile patients [12, 13]. Others showed that DM1 subjects with late diabetic complications are characterised by a lower frequency of blood CD16+ cells in comparison with complication-free ones. Authors suggested that it may be associated with monocyte differentiation into macrophages, which settle down tissues . Macrophage activation profile strongly depends on factors present locally in the tissue microenvironment, i.e. cytokines, growth factors, activated immune cells or microbial products. Therefore, we distinguish two basic types of macrophage polarisation. Classically activated M1 macrophages (polarised especially by LPS, IFNγ and GM-CSF) play a role in tissue damage and produce high amounts of IL-12, IL-23, TNFα or IL-1β pro-inflammatory cytokines. In contrast, alternatively polarised M2 cells (activated by i.e. helminth infections, immune complexes, apoptotic cells, CSF-1 and IL-4) produce high amounts of anti-inflammatory factors (i.e. IL-10 or TGF-β1) and play a role in inflammatory resolution, wound healing and tissue remodelling. M2 cells are further divided into a-d subsets, depending on the type of polarisation agents [15, 16]. Among the transcription factors, which are known to promote M1 or M2 phenotype, we can mention two members of interferon regulatory factors family, IRF5 and IRF4, respectively . M1 to M2 and M2 to M1 polarisation switch is associated with an altered IRF5 expression. Due to its quick adaptation to current microenvironment conditions, it may be considered as the main factor, which controls this process. The IRF5 regulates i.e. production of pro-inflammatory cytokines by M1 macrophages . M2 polarisation may be achieved by IL-4 stimulation which inhibits the IRF5-related M1 activation by Jmjd3-IRF4 axis induction . IL-4 stimulation also downregulates CD14 expression and upregulates CD206 molecule , which are markers related to M1 and M2 phenotypes, respectively [21, 22]. At the end of 2017, Matta et al. reviewed the contribution of altered signalisation of IRFs to the development of autoimmune disorders i.e. multiple sclerosis, Sjögern syndrome, rheumatoid arthritis, inflammatory bowel disease, systemic lupus erythematosus or autoimmune diabetes. Authors highlighted that vast majority of studies, which supported the dual protective and adverse role in the susceptibility to development of autoimmune disorders, were conducted on irf-deficient mice models in vivo. Now, primarily researchers should pay attention to the role of impaired IRF system in patients’ immune cell activity, especially in autoimmune diabetes . There are no works confirming the occurrence of IRF4-IRF5 axis dysregulation in monocyte-derived cells in DM1 juveniles. It is highly possible that macrophages generated in vitro from hyperglycaemia-modified monocytes may present phenotypical changes and show common features with pro-inflammatory M1-like profile [24, 25]. Hence, the aim of our preliminary research was to evaluate the effectiveness of anti-inflammatory macrophage differentiation process in vitro and its relationship to the stage of DM1 in juvenile patients. We have done it, bearing in mind that in vitro cultured, functional IL-10+ M2 cells could in the future be transferred to diabetic patients and may locally play a protective role in resolving inflammation or removing tissue debris and apoptotic cells by phagocytosis. To determine the basic phenotype alterations of M2 macrophages, we examined the expression levels of two signalling surface molecules—the CD206 and CD14. Taking into account that IL-4 polarised cells ought to reduce the CD14 (marker mainly presented by unpolarised cells, M1 or IL-10 polarised M2 macrophages) and upregulate the CD206 levels (characteristic M2 marker) [20, 21, 26], we compared the percentage of the CD14+CD206+ cells in patients with that of healthy controls, expecting the quantitative aberrations. Additionally, as low levels of the CD86 molecule (characteristic for M1 pro-inflammatory cells) on M2 cells may indicate a poor potential to stimulate T cell proliferation, we evaluated the expression of this activation marker on examined subpopulation [22, 27]. We also suspected that the intracellular levels of the IRF4/IRF5 factors may be defective in analysed cell subset, which will probably determine the quality of polarisation process in patients. Next, to extend our research, we discussed the main features of the M2 cells morphology as well as their ability to produce anti-inflammatory IL-10 cytokine, which may be limited in diabetic children. Peripheral blood samples from 25 randomly selected juvenile patients were collected in heparin-containing tubes. Type 1 diabetes mellitus (DM1) was defined in accordance with American Diabetes Association criteria . Ten patients were newly diagnosed (ND-DM1) and their blood samples were collected between days 10 and 15 after diagnosis. Fifteen juveniles were long-standing complication-free patients with type 1 diabetes mellitus (LS-DM1). Blood samples were centrifuged (2500 rpm for 15 min at room temperature), and separated plasma was transferred to 1.5-ml tubes and stored at − 20 °C. At the time of sampling, the glycosylated haemoglobin (HbA1c [%]) was examined. In addition, body mass index (BMI) was calculated for each patient. Subjects with other autoimmune disorders, microvascular complications, acute inflammatory and infectious diseases, history of hypertension or blood transfusions were not enrolled into the study. The control group consisted of six children who were free from autoimmune, inflammatory or infectious diseases. The exclusion criteria also included any history of blood transfusions. The participants were recruited from The Academic Clinic of Paediatric, Diabetology and Endocrinology, Medical University of Gdańsk. Parents of the all enrolled participants gave informed consent to participate in the research. The study was approved by the Ethics Committee of The Medical University of Gdańsk (NKBBN/406/2013) and followed the principles of the Declaration of Helsinki. The basic clinical characteristics of examined patients and main differences between examined groups of patients are presented in Table 1. Eight millilitres of venous peripheral blood from each individual was collected in Vacutainer tubes containing heparin (BD Bioscience, USA). Peripheral blood mononuclear cells (PBMCs) were isolated from the donors’ blood by density gradient centrifugation over Ficoll/Histopaque (Sigma-Aldrich, Poland) and cultured on 24-well plates in RPMI 1640 (Sigma-Aldrich, Poland) supplemented with 5% heat-inactivated foetal calf serum (FCS; Sigma-Aldrich, Poland) and 1% penicillin/streptomycin. Monocytes were isolated from PBMC using immunomagnetic nanoparticles (EasySep CD14+ Isolation Kit®) and cultured at a concentration of 2 × 105/ml of medium at 37 °C with 5% CO2. Cells were differentiated for 7 days into unpolarised macrophages (M0) using M-CSF (75 ng/ml, R&D Systems, Minneapolis, MN, USA) and/or polarised for 24 h into M2 cells using IL-4 (20 ng/ml, R&D Systems, Minneapolis, MN, USA). After incubation time, plates were washed by cold PBS (without Ca2+ and Mg2+) and kept for 10 min on ice. Well contents were collected and transferred to cytometric polystyrene round bottom test tubes (BD Bioscience, USA), washed twice (by warmed PBS) and centrifuged at 1500 RPM for 7 min in order to remove supernatants. Cultured macrophages (suspended in 100 μl of PBS) were labelled by monoclonal antibodies against following surface markers: CD14 (BD Bioscience, PerCP-Cy5.5 Mouse IgG2a, κ), CD206 (BD Bioscience, PE-Cy5, Mouse IgG1, κ), CD86 (BD Bioscience, PE-Cy7 Mouse IgG2a, κ) and intracellular markers: IL-10 (BD Bioscience, PE Rat IgG2a, κ), TNFα (BD Bioscience, Alexa Fluor® 488 Mouse IgG1, κ), IRF4 (BD Bioscience, PE, Mouse IgG1, κ) and IRF5 (R&D Systems, Alexa Fluor® 488 Polyclonal Sheep IgG). All samples were incubated in the darkness for 20 min at room temperature, washed with 2 mL PBS and centrifuged twice (1500 rpm, 6 min). Cells stained for intracellular markers were incubated with ready-to-use fixation buffer (BioLegend, USA) for 20 min in the dark at room temperature and next washed twice with 1 ml of freshly prepared permeabilization buffer (BioLegend, USA). Intracellularly stained cells were suspended in 100 μl of permeabilization buffer and labelled with antibodies in the same conditions like previously. After incubation, labelled cells were washed twice with 1 ml of permeabilization buffer. All stained samples were resuspended in 400 μL PBS. Expression of markers was examined by using flow cytometry (LSRII, BD Bioscience, USA) after gating on live cells based on side and forward scatter characteristic. The mean fluorescence intensities (MFI) of CD14, CD206, CD86, IRF4 and IRF5 markers were verified. Data were analysed by the FACSDiva Software (BD Bioscience, USA). Positive signal for each staining was established using appropriate negative or isotype controls (BD Bioscience, USA, R&D Systems). Statistical analysis was performed using Statistica, ver. 12 (StatSoft Inc., USA). Nonparametric Mann-Whitney U test was used for comparison of the data between groups. For comparison of paired data among groups, the Wilcoxon signed rank test was used. Correlations were assessed using Spearman’s rank test. All the results were presented as a mean ± standard deviation (SD). Those with p values < 0.05 were considered as statistically significant. In our study, monocytes isolated from diabetic juvenile patients and healthy controls were cultured in vitro for 6 days with CSF-1 (M0). On day 6, cells were activated with IL-4 for 24 h (M2). We analysed cells expressing both the CD206 and CD14 markers (CD206+CD14+). Additionally, we examined the expression of the CD86 molecule in the CD206+CD14+ population. The CD86 is a characteristic surface marker of mainly M1 cells  and play a key role in the activation of signal transduction to the nucleus of T lymphocytes via CTLA-4 or CD28 receptors . We identified the CD206+CD14+ cell population in M0/M2 cultures of all study groups. In healthy controls, we observed a significant reduction in the percentage of the examined cells after IL-4 stimulation (p = 0.028) in comparison to M0 cultures. Similar results were identified in diabetic children; however, they were insignificant. Moreover, a number of the CD206+CD14+ macrophages in M2 cultures were significantly higher in LS-DM1 (p = 0.03) and ND-DM1 (p = 0.026) children than in healthy ones. The CD206 expression significantly increased in IL-4 polarised cells of all study groups (P8, Table 2). In contrary to healthy controls, stimulated cells also significantly enhanced the CD86 expression in diabetic subjects. The CD206 (p = 0.041/0.026), CD14 (p = 0.004/0.041) and CD86 (p = 0.041/0.041) molecules were overexpressed in M0/M2 cultures of ND-DM1 patients when compared to controls. All results are presented in Table 2. The expression levels of the IRF4 in the CD206+CD14+ M0/M2 macrophages from LS-DM1 (p = 0.004/p = 0.03) and ND-DM1 (p = 0.002/p = 0.002) patients were significantly enhanced when compared to healthy controls, while the upregulated IRF5 expression was observed in M0/M2 cells of ND-DM1 children (p = 0.015/p = 0.002) only. The IRF4 levels in the CD206+CD14+ M2 macrophages were slightly upregulated in comparison to M0 cells in healthy controls. Contrarily, we did not observe similar effects in diabetic children. In addition, the IRF5 levels in examined M2 cells derived from ND-DM1 and LS-DM1 patients as well as from healthy controls were significantly enhanced when compared with M0 macrophages. All results are presented in Table 3 and Fig. 1. In healthy controls, the median frequency of the CD206+CD14+IRF4+ cells was 46.2. The median frequency of the CD206+CD14+ IRF4+ analysed cells was 87.9 (82.0/97.0, p = 0.052) and 82.8 (66.1/86.0, p = 0.041), in LS-DM1 and ND-DM1, respectively. What is interesting, the median frequency of the IRF5+ cells in healthy controls was 99.55 (99.4/99.57), 98.2 (97.6/98.9, p = 0.041) in LS-DM1 and 93.95 (92.2/97.2, p = 0.065) in ND-DM1 juvenile patients. Significantly higher percentage of M2 cells expressed IRF5 than IRF4 in all study groups. All results are presented in Table 4. Figure 2 describes the macrophage morphology in one representative healthy control, newly diagnosed and long-standing diabetic patient. 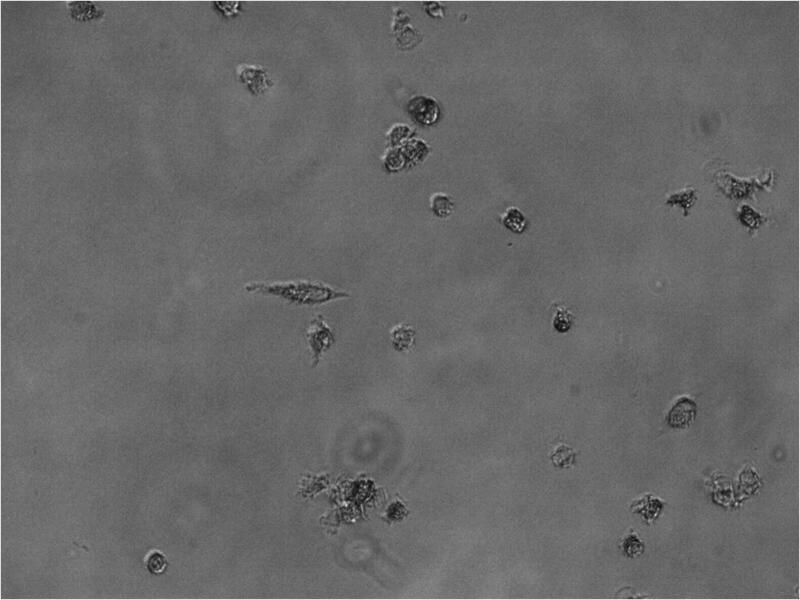 After 7 day lasting in vitro culture, the morphology of adherent M2 cells was highly variable in healthy control: Cells presented both circular and highly elongated, spindle-like shape (Fig. 2a). We did not observe floating cells. Results suggested that established time of culture was appropriate to obtain over 50% of activated and functional cells. Flow cytometry analysis revealed that the frequency of IL-10 producing cells was 69.3%. In ND-DM1 patient no. 1 (Fig. 2b) with HbA1c level of 7.6% cells were adherent, both elongated and spindle shaped. A 30.7% of cells produced IL-10. Results suggested that only some part of cultured cells was activated, presented anti-inflammatory properties and probably could promote inflammatory resolution at the early stage of disease. In LS-DM1 patient no. 2 (Fig. 2c) with disease duration of 4 years and HbA1c of 8.3%, the morphology of adherent M2 cells was also variable in culture, similarly to the healthy control. Most of observed cells were highly elongated. We did not observe floating cells—cells adhered firmly to the bottom of wells. Flow cytometry analysis revealed that the frequency of IL-10 producing cells was 25.7%. Additionally, we analysed the morphology of LS-DM1 patients excluded from all other examinations. Although these diabetic patients fulfilled our enrolment criteria (i.e. they were free from inflammatory and infectious disorders, other autoimmune conditions, hypertension and microvascular complications), they presented parameters of the uncontrolled DM1 (Table 5). Unfortunately, we were not able to analyse M2 macrophage markers in this group (33.33% of all LS-DM1 patients). Namely, usually we observed highly condensed morphology and minor size of cells, what may suggest a cellular damage and apoptosis. In the field of view, we observed low number of adherent, round-shaped and elongated cells (Fig. 3). On day 5 or 7 of culture, we observed enhanced number of floating cells. Moreover, we observed that the disease duration, HbA1c rate, children’s age and duration of the disease were significantly higher in comparison to examined LS-DM1 patients (Table 5). IL-4 polarised M2 macrophages show the intracellular production of IL-10—cytokine with anti-inflammatory properties. The pro-inflammatory TNFα is a rather typical marker for classically activated M1 cells , but it is also produced at high levels by IL-10 polarised M2 cells . M2-activated macrophages derived from LS-DM1 patients showed highly reduced ability to produce IL-10 in comparison to healthy controls (p = 0.0087). It should be mentioned that we were not able to successfully culture macrophages in five long-standing patients (Excluded LS-DM1 patients). We have also noticed that the percentage of the TNFα+ M2 cells in LS-DM1 group was slightly, but significantly enhanced (p = 0.03). In addition, the frequency of the IL-10+ M2 cells in ND-DM1 patients was reduced in comparison to healthy controls, but those results were insignificant (p = 0.18). We did not observe significant differences in the percentage of the TNFα producing cells between ND-DM1 patients and healthy controls. Results are presented in Table 6. It is well-known that macrophage polarisation status is highly plastic, and these cells may exert both anti- and pro-inflammatory effects. The process of polarisation switch depends mainly on the type of activation signals and may be related to a stage of chronic condition. Alternatively, activated M2 cells are important for keeping balance between protective and destructive cell-mediated immunity during the healing phase of inflammation by removing tissue debris and apoptotic cells [31, 32]. Previous studies on streptozotocin-induced (STZ) diabetic mice have shown that the adoptive transfer of in vitro cultured M2 macrophages decreased renal injury, regulated hyperglycaemia and insulitis . This may suggest beneficial role of in vitro derived M2 macrophages also in humans. Moreover, M2 cells produce anti-inflammatory IL-10 , and it was previously presented that treatment with this cytokine prevented the development of autoimmune diabetes in NOD mice  or in combination with IL-4 may inhibit diabetes recurrence . It was also reported in literature that M0 cells may be effectively polarised towards M2 macrophages using IL-4 alone, as well as in combination with IL-13 in normal conditions [22, 36]. As the role of IL-4 in the upregulation of IRF4 is well-known , and we suspected an impaired regulation of this factor, we used this cytokine alone to identify the potential diabetes-related polarisation defects. It should be noted that the excessive, long-term activation of circulating monocytes and macrophages, together with the induction of their pro-inflammatory phenotype, may be related with the chronic exposition to high blood glucose levels in diabetic patients. It is possible that observed modifications and reprogrammed behaviour of monocytes are connected with the phenomenon called ‘hyperglycemic memory’. We assumed that the final effect of the CSF-1/IL-4 stimulation may depend on the activation state of monocytes exposed to hyperglycemia (reviewed in ). Next, the morphology of cultured monocyte-derived cells was also precisely analysed. In our study, we were able to examine adherent macrophages derived from 10 ND-DM1 and 10 LS-DM1 juvenile patients (see Table 1). 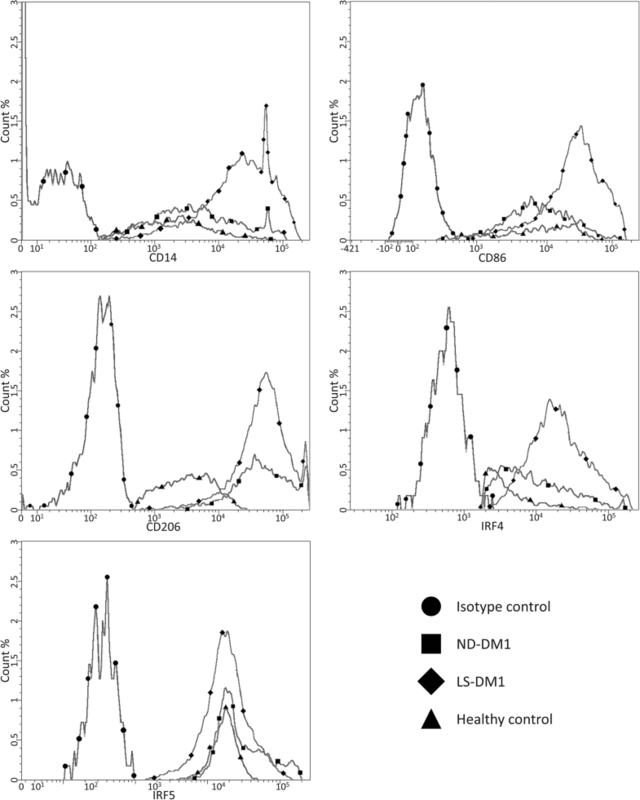 Our results showed that it is possible to induce differentiation of monocytes isolated from DM1 children into macrophages with anti-inflammatory properties (IL-10+ cells), but their percentage was significantly reduced in LS-DM1 group. Moreover, a low percentage of the TNFα+ M2 macrophages indicated that cultured cells were not competent to spontaneously produce this pro-inflammatory cytokine at extensive levels in all study groups. However, taking into account defective macrophage differentiation process discovered in the excluded LS-DM1 group of patients, we recommend the M2 cells of ND-DM1 children as a better model for further research. Probably, those IL-10+ macrophages could be used as inflammatory inhibitors and play a protective role in the development and progression of diabetes . Such a therapeutic approach was implied by Parsa et al., who proposed using transferred immunosuppressive M2 (M2r) cells to inhibit the inflammatory process and β-cell damage. Their study was performed in NOD mice. The intraperitoneal injection of M2r macrophages exerted a protective effect for at least 3 months. Authors used a combination of IL-4/IL-10/TGF-β to reduce the production of pro-inflammatory TNFα and IL-6  . Carrero et al. analysed the role of resident macrophages in the disease development using injection of anti-CSF-1 antibodies into NOD mice. They presented that M2 cell depletion may, inter alia, reduce leukocyte infiltration of pancreatic islets and play a protective, regulatory role in diabetogenesis . However, the role of CSF-1 was also revealed in the pathogenesis of proliferative diabetic retinopathy (PDR) , and Yoshida et al. suggested that its upregulated release from diabetic retina of elderly PDR patients causes M2 macrophage differentiation from recruited monocytes. According to authors, this process is undesired, because it induces retinal neovascularization and fibrosis by an enhanced production of periostin . Unfortunately, as was mentioned above, during the study, we encountered some problems with flow cytometry analysis of M2 markers in 5 LS-DM1 patients. In spite of the fact of using standard procedures of seeding and culturing the cells, most of them were floated on day 5 or 7 of culture and we were not able to perform reliable examination of adherent cells on day 7. Excluded patients were selected similarly as included LS-DM1 patients, but those children had longer duration of the disease and higher values of HbA1c, and were significantly older. These results suggested that maybe other unknown parameters should be much strictly considered, when diabetic patients are enrolled to the study. Going further, this failure could be linked to impaired monocyte differentiation, proliferation and/or enhanced apoptosis of analysed cells. In our opinion, surface expression of CSF-1 receptor (CSF-1R) or possible defects in signal transduction should be further investigated in diabetic patients. For example, the study in NOD mice by Serreze et al. revealed impaired CSF-1R upregulation in bone marrow-derived macrophage precursors . Hitherto, some authors have demonstrated that greater apoptosis of various cell types is a typical defect in DM1 and it may be critical in the development of microvascular lesions [44, 45, 46]. It is quite possible that apoptotic monocytes affect organs that are prone to develop late diabetic complications by stimulating endothelial cell activation and adhesion of leukocytes to endothelium . However, Gautier et al. showed a dual role of macrophage apoptosis in atherogenesis—it may be protective in early stage of disease, but in more advanced stages, defective clearance of apoptotic bodies may favour pro-inflammatory responses and monocyte infiltration of arteries, which intensifies vascular wall damage and plaque progression . Based on these reports and our results, we can draw the conclusion that monocytes in LS-DM1 subjects in addition to their differentiation into desired M2 macrophages failure may impair or block blood flow in small microvessels. On the other hand, even if monocytes transform into cells with similar morphology and function to M2 macrophages, they may show much reduced ability to produce anti-inflammatory IL-10 cytokine. In our study, we observed that the frequency of the CD206+CD14+ unpolarised macrophage population in M0 cultures was reduced after IL-4 stimulation in diabetic children. Examined cells also upregulated the levels of the CD206 marker. Those alterations are characteristic for M2 polarisation process  and are in line with our results from healthy controls. Guzmán-Beltrán et al. also have demonstrated that the number of the CD206+CD14+ M2 cells was reduced in comparison to unpolarised cultures, although the authors used different protocol of macrophage differentiation and activation . In our research, we observed that the number of unpolarised CD206+CD14+ cells in IL-4 stimulated cultures was significantly greater in diabetic children when compared to healthy ones. What is more, results presented that the analysed population preserved high levels of the CD14 receptor in ND-DM1 children, which is more characteristic for M1 or IL-10 polarised M2 macrophages (M2c) [21, 26]. The CD14 may play a role in recognition and removal of apoptotic and necrotic cells [32, 49]. Moreover, analysed population also overexpressed the CD86 marker in diabetic children, and those features together with high level of CD14 are completely uncommon for M2 cells and may be connected to the diabetes-related activation status of cultured monocytes. Prior research conducted on recent-onset diabetic children showed elevated levels of the CD86 surface marker on the intermediate monocytes. Authors suggested that those cells present higher ability to present antigen than cells in healthy controls . We conclude that the higher frequency of unpolarised cells in M2 cultures of diabetic children, in conjunction with impaired macrophage differentiation and limited IL-10 production in LS-DM1 children, indicates limited effectiveness of alternative macrophage polarisation in diabetes. Moreover, the overexpression of the CD14/CD86/IRF5 markers suggests that the phenotype of examined M2 macrophages presents common features of M1 cells. Our results also concern the IRF4 and IRF5 levels in examined CD206+CD14+ cells from M0/M2 cultures. Xu et al. in their review emphasised the meaning of altered IRF4 expression in the development and activity of immune cells, and in the initiation and progression of some autoimmune disorders (i.e. lupus erythematosus, Crohn disease, diabetes mellitus type 1 or multiple sclerosis). What is important, the IRF4-deficient mice were more prone to develop autoimmunity . We revealed, that in healthy controls as well as diabetic patients, M0 and M2 CD206+CD14+ cells showed both the IRF4 and IRF5 intracellular expression. Significantly higher percentage of the CD206+CD14+ M2 cells expressed the IRF5 than IRF4 in all study groups, which may suggest a dominant role of IRF5 and its constitutive expression in analysed population. Xu et al. demonstrated on the example of EBV-mediated transformation of B lymphocytes that levels of the IRF5 factor may be repressed by the IRF4 overexpression . In our study, a minor upregulation of the IRF4 levels, together with an enhanced IRF5 intracellular expression in the examined macrophages of healthy controls, suggested that on the day 7 of culture, under given conditions, cells presented low capacity to polarise completely. It is possible that longer duration of culture and fresh medium with CSF-1 and IL-4 might induce further differentiation. The molecular mechanism which leads to enhanced IRF5 expression is still unclear for us and is probably not directly induced by IL-4. In their work, Hsu et al. showed that IL-4 activation of CSF-1-treated macrophages upregulated transiently both the IRF4 and IRF5 mRNA expression . This is in line with our results of enhanced intracellular expression of IRF4/IRF5 molecules. Surprisingly, in the CD206+CD14+ M2 cells, the IRF5 expression levels were significantly increased in ND-DM1 and LS-DM1 study groups, but we did not observe elevated IRF4 levels. Krausgruber et al. previously confirmed the inhibitory role of the IRF5 expression on the IL-10 transcription in human M2 macrophages. They suggested that IRF5 directly binds to il10 promoter and suppresses IL-10 transcription . Our results, together with significantly decreased IL-10 production in LS-DM1 patients, suggest that M2 activation process may be disturbed by altered response to IL-4 and an impaired induction of the IRF4 in examined cells. Increased IRF5 levels probably may have repressed M2 phenotype switching. We have also noticed that the IRF4 and IRF5 intracellular factors were overexpressed in analysed M2 population derived from diabetic patients in comparison to healthy controls. 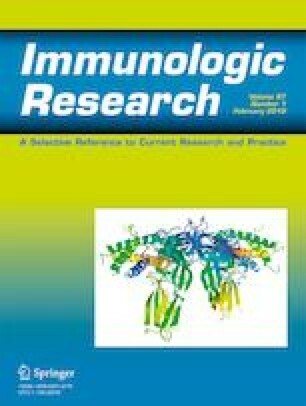 Hypothetically, higher IRF4 expression level in differentiated macrophages from our study may be interpreted as a kind of compensatory immune mechanism generated under inflammatory state, to keep a balance between anti- and pro-inflammatory responses, but it is hard to speculate which condition leads to the IRF4 and IRF5 overexpression in DM1 patients. However, the epigenetic modification in gene expression may contribute to dysregulation of macrophage polarisation status . For example, upregulation of the Irf4 may be induced by Jmjd3 via demethylation of H3K27 in normal condition , but it may be disturbed by hyperglycaemia. Gallagher et al. reported that Jmjd3 overactivity in bone marrow progenitor cells from mice with impaired glucose tolerance correlates with enhanced wound inflammation and affects M2 cell differentiation . Moreover, work of Stone et al. showed that the activation and nuclear accumulation of the IRF5 in monocytes from SLE patients is induced by circulating autoantigens (apoptotic/necrotic particles), and it is overexpressed in comparison to other cell populations . Summarising, our study brought the observation that the M2 polarisation process is less effective in diabetic children than in healthy controls and it may vary depending on the stage of disease. We identified enhanced number of unpolarised cells (CD206+CD14+) in M2 cultures in comparison to healthy controls. Although monocytes of ND-DM1 children were still able to differentiate into regulatory IL-10+ M2 macrophages, this process was highly limited in LS-DM1 patients. Our results suggested that cultured M2 cells showed common features with M1 cells (high levels of the CD14/CD86/IRF5 markers) in ND-DM1 patients; however, they were weak TNFα producers. In our opinion, IL-10+ M2 macrophages that resolve inflammation could be used in the future adoptive therapy experiments in diabetic subjects. However, before the application of this therapy, we propose that the problem of too high expression of IRF5 should be somehow resolved to prevent pro-inflammatory phenotype switching. Indeed, it was previously revealed that the IRF5 gene silencing suppressed levels of IRF5 in cardiac macrophages, reprogrammed their phenotype and supported the inflammatory resolution . There are also some known IRF5 inhibitors , like TRIM28 or KAP1 , flavonoids called Baicalin (which simultaneously promotes M2 phenotype by IRF4 upregulation)  and Quercetin  or polyphenol called Mangiferin . To our best knowledge, this study for the first time revealed altered IRF4/IRF5 axis in M2 monocyte-derived cells in DM1 patients. The presented study has some limitations, so further analysis is needed to confirm and evaluate obtained results. Issues that particularly need attention involve examination of a larger number of subjects and comparing obtained results with the values of basic clinical and biochemical parameters. Also, the profile of analysed cells should be much more extended and include the production of typical anti or pro-inflammatory chemokines. In addition, mentioned disadvantages of macrophage differentiation process in diabetic patients as well as altered expression of IL-4 receptor on cultured macrophages as a probable cause of impaired IL-10 production should be taken into account. This work was supported by the State Committee for Scientific Research ST28 (Medical University of Gdańsk, Poland).